Rene A. Gagnon was born on 7 March 1925 in Manchester, NH, the only child of French-Canadian mill workers, Henry and Irene Gagnon. Shortly after his birth, Irene divorced her husband when she discovered he was the father of a child with another woman. Quiet and polite, Rene kept in the background while his mother worked in the mills to support the two of them. After two years of high school, Rene dropped out of school to join his mother in the mills, working as a doffer (they replaced full bobbins with empty ones on the thread making machines), while living at home. When he received his draft notice in May 1943, he immediately enlisted in the Marines. After boot camp at Parris Island, he was promoted to Private First Class and assigned as a Military Policeman to Charleston Naval Station, SC. In January 1944, he was reassigned to the newly forming 5th Marine Division at Camp Pendleton, CA, and slated for the upcoming invasion of Iwo Jima. The invasion of 70,000 marines landed on 19 February 1945, on the south side of the Island, with Gagnon landing at Green Beach, closest to Mount Suribachi. Rene was made a Company Runner, carrying messages to and from the Company CP. During the Battle for Iwo Jima, Gagnon was assigned to E Company, 2nd Battalion, 28th Marine Regiment, 5th Marine Division, and one of six men who were immortalized in Associated Press photographer Joe Rosenthal's photo of the U.S. Flag raising on Mount Suribachi, Iwo Jima, just after noon on 23 February 1945, for which Rosenthal was awarded the Pulitzer Prize. The six men were Corporal Harlon Block, Private Rene Gagnon, Private Ira Hayes, Private Franklin Sousley, Sergeant Mike Strank, and U.S. Navy Corpsman HM2 John Bradley. Author James Bradley described his life's story in the bestseller, "Flags of Our Fathers" (2000). The flag in the famous photo is the second U.S. flag raised over Mount Suribachi; the first flag was raised there at 10:20 am by Sergeant Henry Hansen, Platoon Sergeant Eugene Thomas, Corpsman John Bradley, Private Philip Ward, Private James Michels and Corporal Chuck Lindberg, and photographed by Sergeant Lou Lowery. Corpsman John Bradley is the only one in both flag raising photos. On the fourth day of the invasion, the Marines captured Mount Suribachi and raised the American flag. Rene carried the second flag up the mountain slope and helped to raise it, replacing the first (and smaller) flag. 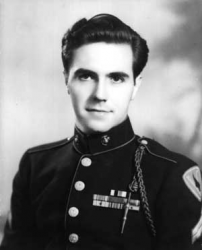 Following the capture of Mount Suribachi, the 28th Marines were redeployed to capture the west coast side of the Island, and when the Island was finally secure, Gagnon returned to the U.S. where he was ordered to participate in the 7th War Bond Rally. He was one of only 50 men out of the original 310 men in E Company who survived the battle without being wounded or killed. During the War Bond Rally, he married his hometown sweetheart, Pauline Harnois, on 7 July 1945 in Baltimore, MD. When the Bond Rally ended, Rene was posted to Tsingtao, China, until April 1946, when he was returned to the U.S. and honorably discharged from the Marines. He initially returned to his former life in the Manchester Mills. He and Pauline had only one child, a son, Rene, Jr. born two years later. While working as a janitor at Colonial Village in Manchester, Rene Gagnon was stricken with a heart attack and died instantly at his work place, at the age of 54. 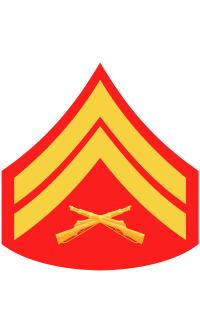 Corporal Rene A. Gagnon died on 12 October 1979 in Manchester, NH. He is buried at Arlington National Cemetery in Arlington, VA.